Deborah Grant rushed for three touchdowns Tuesday afternoon as Green Valley’s flag football pulled out a 28-13 home win over Cimarron-Memorial. Christina Mayberry caught a touchdown pass from Jennifer Haberstock for the Gators, and Mayberry and Jazlyn Camacho each intercepted a pass. Silverado 32, Liberty 19 — At Liberty, Arielle Meikie and Mai-Kia each scored a touchdown in the win over the Patriots. Bryanna Salazar of Liberty had seven tackles. Shadow Ridge 27, Desert Oasis 6 — At Shadow Ridge, Alexis Payne had 11 rushes for 110 yards, including a pair of 5-yard touchdown runs, as the Mustangs topped the Diamondbacks. Quarterback Mikayla Brown completed 19 of 26 passes for 159 yards, including a 4-yard TD pass to Bobbie Wright for Shadow Ridge. Ebonii Starks supplied 84 rushing yards on six carries for the Mustangs, who got an interception apiece from Jada Jones and Samantha Guerra. Coronado 35, Rancho 6 — At Coronado, Kaylin Hall passed for 206 yards and four touchdowns to lead the Cougars over the Ram. Reagan Raimner, Bridget Podlesni, Ashley Taibi and Sydnee Hansen each caught a touchdown pass for Coronado. Ava Yarbro added 90 rushing yards and a score for the Cougars. Las Vegas 13, Canyon Springs 0 — At Las Vegas, Kaitlyn Horstdaniel threw for 169 yards with two touchdowns and Brinkley Mcoy ran for 75 yards on nine carries as the Wildcats stymied the Pioneers. Brooklyn Stone caught six passes for 85 yards and a touchdown and Hailey Rebibes caught a TD pass for Las Vegas. 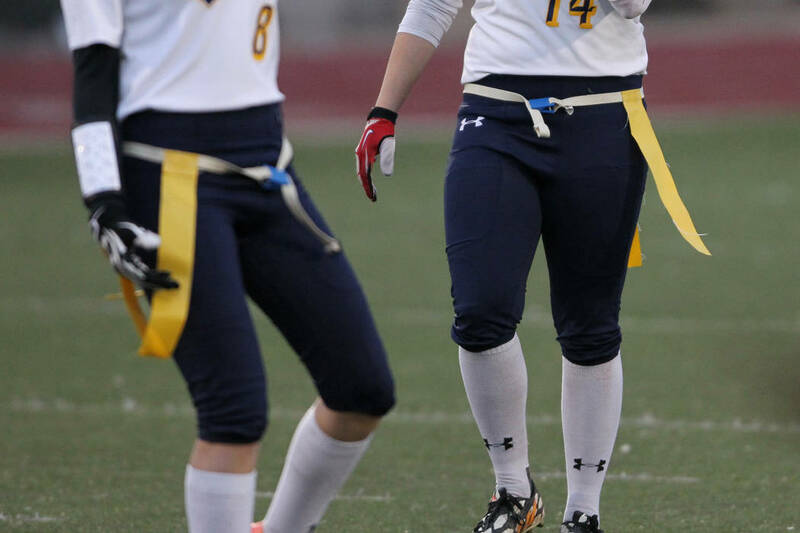 Victoria Barney had three catches for 62 yards and Lalita Kumar had six tackles for the Wildcats. Tech 6, Palo Verde 0 — At Palo Verde, Emily Sepulveda caught a 5-yard touchdown pass from Taylor Ritayik in the finla minute to give the Rodrunners the win over the Panthers. Ritayik ompleted 12 of 23 passes for 197 yards. Sepulveda had two catches for 45 yards, and Erin Adarve had five catches for 90 yards for Tech. Adarve keyed the defense with nine tackles and an interception. Adriana Carrillo also intercepted a pass for the Roadrunners. Sierra Vista 57, Basic 0 — At Basic, Mariyan Muhammad rushed for 121 yards to help the Mountain Lions beat the Wolves. Aaliyah Medina completed 14 of 25 passes for 280 yards for Sierra Vista, which led 12-0 at the half. Jamile Waipunacaught six passes for 170 yards, and Brianna Miller had six catches for 74 yards for Sierra Vista. Arbor View 31, Chaparral 6 — At Arbor View, the Aggies defeated the Cowboys. Makayla Rucks threw for 62 yards, completing one touchdown pass. Cheyenne 20, Eldorado 6 — At Eldorado, the Desert Shields beat the Sundevils.